Ashley graduated in April 2012 from the University of Michigan School of Music with a Bachelor’s Degree in Violin Performance. Born and raised in North Carolina, she has been playing the violin since the age of 7, and has always aspired to be a professional violinist. She comes from a musical family: her mother is a violist in the North Carolina Symphony, and her father is a band director and strolling clarinetist and saxophonist. Ashley has attended numerous music festivals around the country, including North Carolina’s Brevard Music Festival, Meadowmount School of Music in New York, and the Kennedy Center Summer Music Institute in Washington, D.C.
She has won various competitions in Raleigh and in Michigan, including 2nd place in the Musical Society for the Arts Competition, 1st place in the Robert C. Young String Competition, the first and youngest string player ever to win the Raleigh and Durham Symphony concerto competitions in high school, and the Triangle Youth Philharmonic Concerto Competition. She was also chosen to represent the School of Music in Michigan Conservatory Project and got to perform a solo at the Kennedy Center in Washington, D.C. Although Ashley has had an extensive background in Classical music, she is equally as passionate about learning other genres of music such as Irish/Scottish, Bluegrass, Blues, and Swing and was in a Bluegrass band called Swift Creek for two years. She has been recorded on 5 CDs, including playing the music in the background for a T.V. commercial. 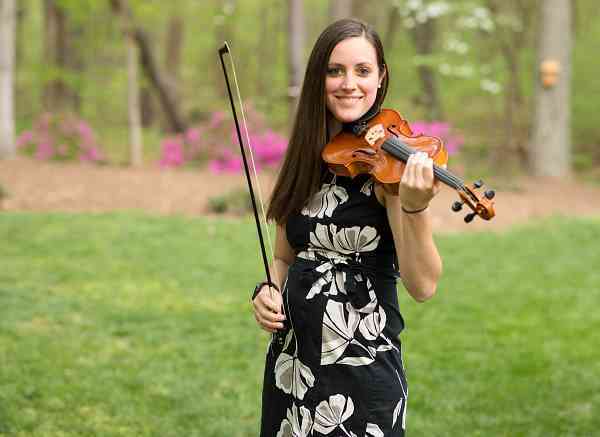 She is also passionate about teaching multiple genres such as during her 3 years of teaching private Suzuki Violin lessons/Fiddle Class at Meredith College and teaching at Lamar Stringfield Music Camp. She was also the Strings director at Cardinal Gibbons High School, Our Lady of Lourdes School, and Saint Raphael’s School from 2015-2017. Ashley currently performs regularly with the North Carolina Symphony and various other ensembles in the triangle area and is private teaching in order to have more time with her two children Abigail and Declan.